William Robertson (1834 - 1924) came to Rochdale in 1860 as a journalist for the Rochdale Observer and fell in love with the town and surrounding area. He devoted much of his time to creating popular histories of the town and its inhabitants. 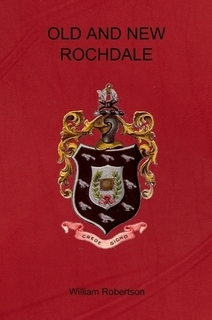 At the heart of the Industrial Revolution, Rochdale had gone through a huge transformation of growth, wealth and politics. On the whole his histories concentrate on life before the upheaval rather than the grind and poverty of factory life that his readers would be all too familiar with. Old and New Rochdale takes a meander through the town of Rochdale and some of its outlying areas (which have merged into the town in modern times) weaving a tale built up from the oral history and anecdotes of the area. Robertson in part financed his books by persuading local businesses to place advertisements and these can be found at the back of the book giving further insight into the character of the town at this time.